These versatile glasses can also be used for serving chilled water, cocktails, and more. Durable and chip resistant, this crystal clear stemless drinkware is stable, ergonomic, and balanced for less tipping and more sipping. Perfect for casual dining and entertaining, Libbey's set of 12 stemless champagne flute glasses feature a sophisticated, upscale curved design that's ideal for all your bubbly beverages. Durable and chip resistant, this crystal clear stemless drinkware is stable, ergonomic, and balanced for less tipping and more sipping. This set includes twelve 8.5-ounce flute glasses. 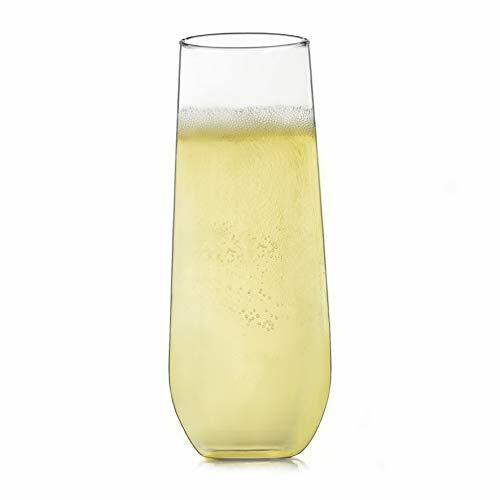 Offering more than just a trendy, modern design, Libbey's stemless champagne flutes feature a slender bowl and narrow rim to optimize the bouquet, taste, and effervescence of champagne, prosecco, mimosas, sparkling wine, or any fruity fizz. These versatile glasses can also be used for serving chilled water, cocktails, and more. Bring them home for yourself, or present as a gift at weddings, birthdays, anniversaries, or any celebration. Each champagne glass measures 5.75 inches tall and 2.25 inches round. Dishwasher safe for quick, easy cleanup. Made lead-free in the USA. Celebrate This with Glassware from LibbeyIf you’ve ever sipped from a glass, odds are you’ve already met Libbey. We rank as the top glassware manufacturer in the Americas and one of the largest tableware suppliers in the world. As the runaway leader, we are setting new standards for stability, strength, and growth opportunity. We believe every occasion — big and small — is an opportunity to celebrate life.